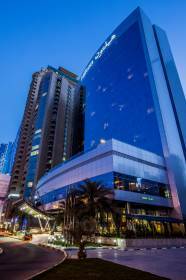 Hilton Sharjah is located in the heart of the Emirate and only 10 minutes drive from Dubai with normal traffic. All 259 guest rooms and suites provide floor to ceiling windows which ensure breathtaking views of the Khalid Lagoon or the Sharjah skyline. Upgrade to our extremely popular Deluxe Room or choose an Executive Room or Suite for a high-floor room and access to the Executive Lounge with numerous complimentary benefits.This elegant hotel features two restaurants and two lobby lounges. Stay fit using the modern equipment in the fitness center, indulge in a treatment at the spa, work out on the squash court or relax in our three outdoor pools with view of the Lagoon.Several times a day, the hotel provides a number of complimentary shuttle services to a nearby private beach and one of Dubai’s major shopping destinations. Hilton Sharjah provides easy access to corporate districts and its proximity to Sharjah Expo Centre makes it an ideal location for hosting business meetings or special events. Choose from three boardrooms with audio/visual equipment, a VIP lounge, pool terraces, and a pillar-less, divisible and soundproof Grand Ballroom for up to 500 people.